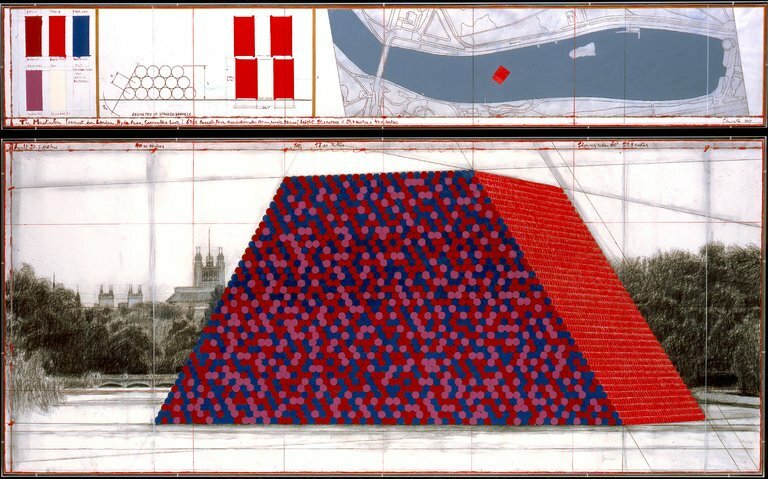 Christo has long been interested in mastabas, trapezoidal structures that originated in Mesopotamia. He designed a Texas mastaba in 1975, for example, and is devising plans to build a permanent one in Abu Dhabi, which he says will be the largest art structure in the world. But before then, he will build one this summer in Hyde Park in London that will be made up of 7,506 oil barrels and float on the Serpentine lake, behind Kensington Palace. The temporary structure will be unveiled around June 20, in conjunction with an exhibit at the nearby Serpentine Galleries on Christo and his wife and artistic partner, Jeanne-Claude, who died in 2009. Standing about 65 feet tall and weighing 500 tons, the mastaba will be anchored to one spot but will still bob up and down. The Westminster Council approved the proposal last week. The mastaba will use 50 times fewer barrels than the planned Abu Dhabi version; while that one will primarily be orange, the British mastaba will take on the colors of its country’s flag — blue, red and white — as well as purple. “The mauve is very royal,” Christo said. The project was conceived in October 2016. Last year, Christo tested its feasibility by building a model the tenth of the scale in the Black Sea off the coast of Bulgaria, his home country. As he has done in the past, he will fund the project, which he estimates will cost $4.2 million, through the sale of his art.